Air pollution is a major concern in almost all the cities. One of such city is Bangalore, which is capital of Karnataka. Bangalore is known as Garden city. It is considered as one of the best city in the country, with a beautiful weather year around, surrounded with beautiful places, the whole city full of trees and small parks, ponds, lakes. Bangalore is indeed the most pleasant and cool place to live. With the rising industrialisation, construction, development the label of “Garden City of India’ is diminishing. The city has become hub of IT sector and many industries providing employment opportunities to numerous people, thus leading to population and expansion of the city limits. Establishment of industries, offices has lead to road widening, construction of more buildings, cutting of trees, thus damaging the peaceful and pleasant environment of the city. Today, we can see huge buildings and heavy traffic. More traffic and more population has resulted in air pollution in the city. Traffic has risen tremendously in past 15 years. The flow of vehicles has become too prominent. Garbage dumps have increased. These garbage dumps are burnt every now and then, causing huge smoke. This has not only polluted air quality but also water pollution and land. The water has become contaminated resulting in many health issues. Vehicular emission has main contribution to the pollution of the city along with dust of construction activities. The main contributor is vehicle emission. The growth of more and more vehicles along with rising population has lead to vehicular pollution. People do not use public transport as they do not find it more comfortable and frequent, thus increasing the number of vehicles per person. More number of vehicles also cause more traffic and vehicles emit more smoke in traffic. Second reason for air pollution in Bangalore is dust. Constant construction activities has lead to lots of dust particles. The road widening process, emits lots of sand and dust, construction of buildings leads to wood dust, cement and sand. The dust on the roads is so much that by the time you reach your destination, your eyes are filled with black dust. Garbage dumping : Few years back garbage was dumped at the outskirts of the city where there were no buildings. With the expansion of city limits, these dump-yards have become unavailable and there these are dumped anywhere in an open space and burnt there. The smoke coming from burning of garbage dumps spread over a huge area leading to choking in public. burning of Leaves and other trash has become a common scenario in many places. Vehicle emission, industry smoke release lots of harmful gasses, which lead to many health issues. Doctors advice to keep oneself protected in any way possible, from these harmful pollutants. Heart Diseases, asthma or respiratory diseases. Illness associated with Lung infection, bronchitis, flu, especially in small kids and older people, whose lung systems are weak. Skin diseases or skin rashes, as the fine dust particles settle easily on skin. Watery eyes, headaches, sinusitis, or any from of allergies. Risk to pregnant women and unborn child and infants. While many doctors, suggest many ways to protect oneself from air pollution. It is advised that one should avoid going out during peak hours, use masks whenever you go out, try to close windows and install air purifiers at home, go for regular check ups, get pollution check done for your vehicles frequently. Go for carpooling and use public transport as much as possible, try walking or cycling this will reduce vehicle emission. Avoid burning of garbage or any thing in bulk which emits lot of smoke or smoking in public places, especially on roads etc. where there is already lot of pollution. 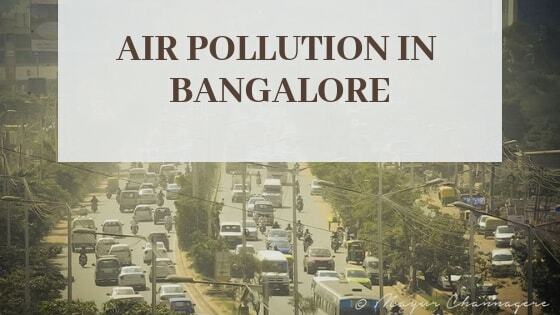 Vehicular traffic and emission and burning of waste are the major reason for pollution in Bangalore, contributing 25% each and rest by construction dust. According to sources, an observation done, in 2018 autos emit 1200 tones of carbon in a day, 4 tonnes of NOx and 0.5 tonnes pf PM10 in Bangalore. The particulate matter during peak traffic hours is PM2.5 and PM10. The Air Quality index ranges form anywhere to 118 to 159 which is considered as harmful. As per the observations made in 2018, the pollution caused by industries spiked to 27-units, urbanization has lead to increase in diesel generators for power backups in many buildings, and this has lead 7-8 units of pollution in such areas. Road dust contributes to 45-55 units and vehicles 10 – 22 units of pollution. On an average PM10 has been recorded between 2018 April to December. While the Air Quality Index is within the permissible limits, it is advised the government should take necessary steps to ensure that this does not exceed. While the government has taken many steps to curb the pollution one of them which is most appreciable is E-Autos. These E-Autos emit very less or no smoke and are very user friendly. Well, these are used only near metro stations and nearby areas as of now, but it is a great step. Public awareness through various NGOs are being carried out. Planting of more trees, public transport, carpooling etc are some of the major things being implemented in the city. Dumping yards being set up far away from residential areas, and control of burning activities in and around city limits. Reducing power cuts, will lead to less usage of generators, banning vehicles which are old more than 15 years, sprinkling of water on roads. The rapid growth in urbanization, setting up of companies and population has many adverse effects on the city, and the major concern among them is pollution. The rapid increase in industrialisation has lead to environment degradation. While nothing can be done to decrease this, control measures can be taken to curb the pollution and its effects. There is a need for traffic regulations, comfortable and efficient public transport and penalties for any violations in order to protect the environment. Introducing more roads may not solve the issue as it will only lead to more cars and two wheeler on roads. The planning should be made such that public use less of their own vehicles and use more of public transports, or car-polling. The solution should be that there should be less number vehicles on roads, or if there are any vehicles they should be environmental friendly in the sense they do not emit much smoke. Planting trees or plants around the city especially on highways, roads, dividers will also provide a relief. Pollution is a raising issue and cannot be solved unless everyone government and public solve it as a team, but it requires a very dedicated efforts from both of them. The long term effects of pollution is going to borne by generations, so it is high time that everyone stand up against this issue and fight against it. This is a time taking activity and will take years to sort the things but the result of this will be enjoyed by generations to come. Infrastructural facilities such as roads and transport system should be restructured, this would also help to great extent. Encouraging public to use more public transport and providing them with good and comfortable transport facilities would also be beneficial. Implementing proper rules and enforcing them in proper manner would restore the charm and beauty of Bangalore making it a pleasant city again with more trees and parks, and regaining its label of “Garden City”.